Charles IV established this church in 1355 as part of the Augustine convent. Although the church's current Baroque appearance dates back to 1737 – 1741, certain Gothic elements still remain, such as the tall octagonal tower, nicknamed the "Prague minaret". The Church of St Katherine of Alexandria is located on the premises of the General University Hospital, and is under the religious administration of the Orthodox Church. 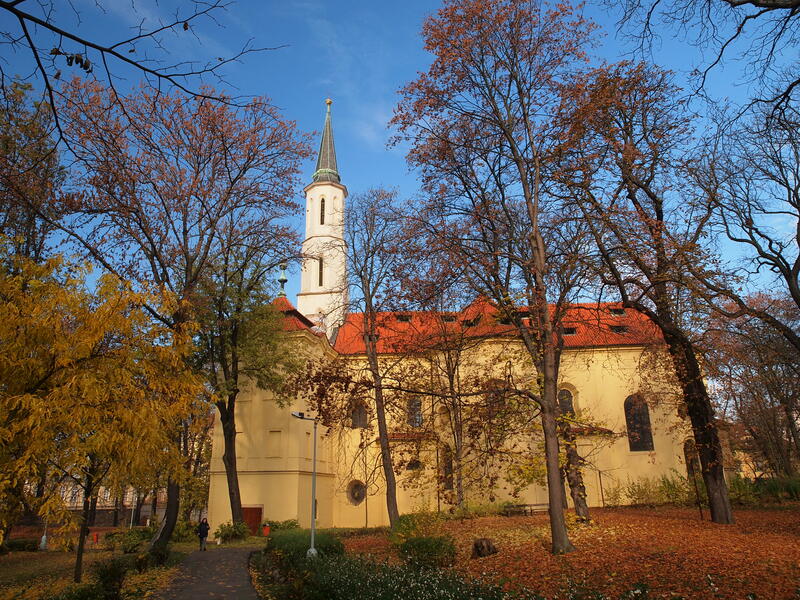 Upon the impulse from Charles IV, who won the Battle of San Felice on the day of the St. Catherine’s feast, a monastery and the only church consecrated to the popular St. Catherine was built in Prague. St. Catherine was a beautiful and educated Christian woman of a royal origin, who persistently refused marriage proposals from pagan noble men, and who turned to Christianity 50 pagan philosophers only by means of her oratory skills. In the end, she was executed after cruel torture upon a command of a Roman Emperor. She was a patron of philosophers and students, of rhetoricians and librarians. The churches at that time were established in order to bring blessing upon the town. Therefore the locations of the St. Catherine’s Temple, the Vyšehrad Church, the Emauzy Monastery and the Church of Virgin Mary on the Grass form a cross. The church and the monastery were built in the years 1355 - 67 for the Order of the Calced Augustinian Nuns. In 1420, the monastery was burnt down by the Hussites, but the Gothic church remained in operation in its original appearance until the 18th century. The monastery was long shattered, and only in the 16th century, the place was settled by the male Augustinian Order, due to lack of Augustinian nuns, and they reconstructed the object. 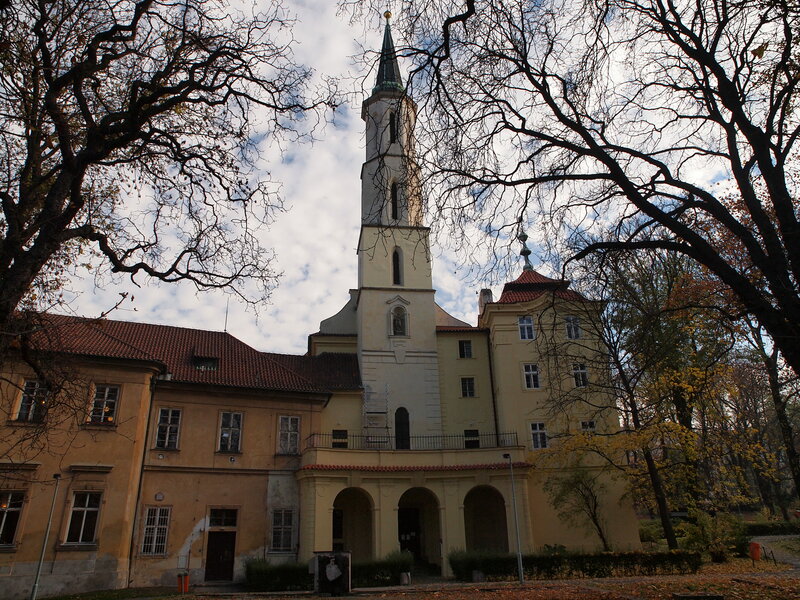 Today’s three-wing monastery building was built in the years 1718 - 30 in Baroque style by František Maxmilián Kaňka (some sources name Kryštof Dientzenhofer), and several years later in the period 1737 - 41, a new Baroque church was built according to a project of Kilián Ignác Dientzenhofer. A unique Baroque hall construction with a transept was built, with rich architectural segmentation in the interior. Only the tall narrow tower named “Prague Minaret” was preserved from the original Gothic church, which is quadrangular at the bottom and octagonal at the top. 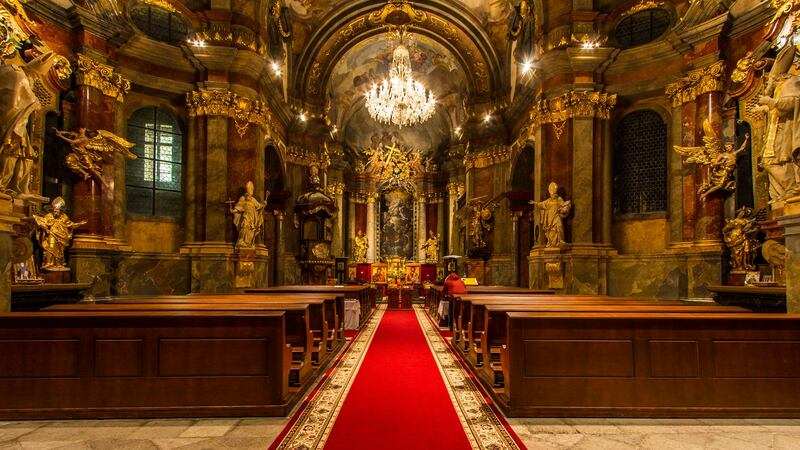 Today, the church is considered to be one of the most beautiful buildings of Prague’s high and late Baroque. The church’s interior excels with beautiful Baroque ceiling frescoes surrounded by rich stuccoes by Bernardo Spinetti. The frescoes representing scenes from the life of St. Catherine and St. Augustine and St. Nicholas of Tolentino, were painted by Václav Vavřinec Reiner. The central fresco depicts educated disputation of St. Catherine with the pagan scholars. A set of statues by František Ignác Weiss decorates the altars, the pulpit, the organ and the architecture as such. The statues represent an exceptionally valuable collection of late-Baroque wood carving. The church and the monastery were abolished via the decree of Joseph II in 1784, and they were desecrated subsequently. A military education institute was placed in the object, which remained here until 1822. At that time, the artistic monuments suffered great losses. The church was later restored and it was consecrated again in 1841. During the 20s, there was a branch of Prague’s mental asylum Irrenhaus, and in 1826, following an adaptation of the monastery, an institute for the deranged was opened here with a capacity of 250 patients. Bedřich Smetana was among those who died here. In 1950, the church, as the city property, was transferred into the administration of the City Museum, which established a wood carving depository here. Currently, the cathedral is under the administration of the Orthodox Church.